A study found that regular ibuprofen use could lead to infertility. Researches for the study found that testicle samples produced less testosterone after a 24-hour time period, and those men who were exposed to ibuprofen longer were affected more. The researchers for the study recruited 31 healthy men between the ages of 18 and 35. Fourteen of the men took two 600-milligram doses of ibuprofen per day for six weeks, while the other 17 men took placebo pills. Advil™ and Motrin™ are two brand names for the Nonsteroidal Anti-inflammatory (NSAID) ibuprofen. Motrin™ is a well-known household painkiller, often used by athletes and those in the military to treat aches, pains, muscle strains and even sprains. Service members often joke about the excessive prescription of ibuprofen to cure just about any- and everything, commonly given as an 800-milligram dosage. There are countless memes around the Internet joking about the military’s use of ibuprofen. 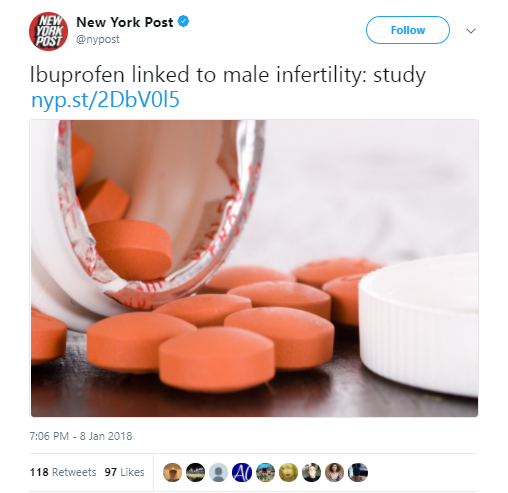 According to the study, researchers found that ibuprofen use may lead to “compensated hypogonadism,” which suppresses testosterone production and can lead to infertility and erectile dysfunction. Through blood tests and hormonal analysis, researchers found higher blood levels of luteinizing hormone (LH), which regulates testosterone and hormone production. People who read the study should be cautious of its results due to its small sample size, according to a trade association that represents manufacturers and marketers of over-the-counter medicines like ibuprofen. The study “relied on an extremely small sample size (just 14 people in the ibuprofen group) and in which subjects were administered ibuprofen for durations longer than those approved for [over-the-counter] use,” according to a statement from the Consumer Healthcare Products Association, Military Times reported. “Further, despite measuring numerous clinical endpoints, the authors reported only small effects in a limited number of these,” the statement added.